Fostering my artistic abilities is the way I prefer to spend most of my time. 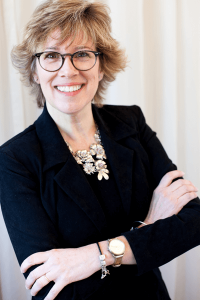 Although art was a part of my childhood with both parents involved, they were insistent that I would be better prepared for life if I went into economics and accounting. As a result, it has taken a number of years for me to honor my own creativity. By day, I am employed as a special needs paraprofessional working mostly with autistic kiddos. Aside from being a mom, it is one of the most rewarding jobs that I have ever had. My grown daughters need less of my attention allowing me time to study as well as hone my skills. One of the first seminars I took was a Zentangle ® class… which lead to an illustration class… and with that, the floodgates opened. My love of realism and the challenge of pushing myself to make it better gives me the opportunity to revisit old and new mediums. Learning to embrace abstract concepts is also an enlightening process, giving me new appreciation and understanding of the fine art world. I’m a self-taught artist working in a variety of mediums including papercutting, pen & ink, watercolor, and Zentangle. My work so far has been to capture the simplicity of a subject or feeling, with Zentangle. I let the pen direct me, the outcome is always a surprise. A lifelong dream of mine was to become an art teacher to share my love of being creative, however, my path didn’t take me in that direction. 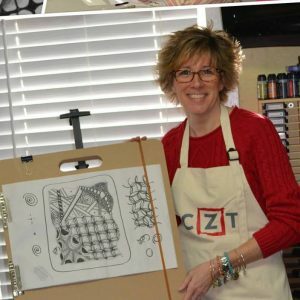 In 2013, I became a Certified Zentangle Teacher (a CZT) and it was my launching point back to finally realize a lifelong dream: teaching others to find their creative spark and let it glow. It is my privilege to teach at conferences, retreats, local groups and private classes with students of all ages and abilities. My work has been published both nationally and internationally. I continue to show in local galleries. As well, I accept commissions, which is work I find very rewarding. Cari and I met in 2013 at a Zentangle Certification Seminar. Three years later, we continue to meet both virtually and face to face. Of the many talents she possesses, her infectious laugh makes everyone feel comfortable. Even though we are both CZTs, I have had the privilege of taking one of her classes and have experienced her skill as a teacher, first hand. Not only does she know her subject, she also gives instructions clearly, is patient and insightful in “reading” each student in her class. Her people skills are an advantage over others who teach the same subject. Add to this, a healthy dose of humor and you have fun while learning. Who could ask for anything more?